Phi Phi Scuba Diving Centre Organises Fun dives To the main reefs of Phi Phi Ley, Koh Bida, Shark Point, the wreck as well as a host of other smaller Phi Phi dive sites. The fun dives Are popular with the in 25-40 cool crew that cruise around the Thai Islands enjoying life so that each trip offers somebody new to meet as well as first class diving. This makes for interesting dive trips with like minded people. 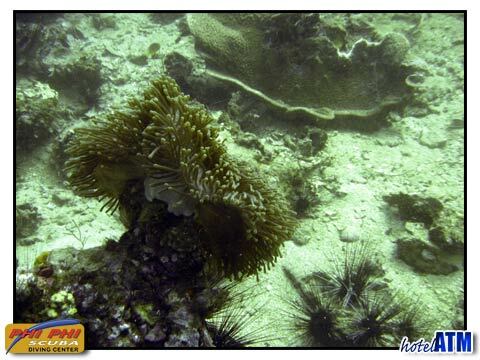 Phi Phi Scuba Diving Centre focuses on the reefs 12-30 meters mainly around the steep walls of Phi Phi Ley and Koh Bida. There is no end of superb dive sites underneath the towering cliff walls of Phi Phi Ley. The sea beds are littered with huge boulders and angular rocks so that the dive sites are a continual exploration of nooks and crannies. The soft corals that grow here in low season are a joy to see and the minutiae of marine life tremendous. Off in the deeper waters Whale shark can be spotted but this is mainly in the high season months of October to April. What you are more likely to see are the turtle, octopus, moray eel, teaming shoals of reef fish and larger predators. The main deep dive is out at Hin Muang which needs the divers experience and good weather as the speed boat trip is about 1 hour 20 minutes. Phi Phi Scuba Diving Centre also focuses on education and has many opportunities for those wishing to start diving with Open water or take advanced classes all the way up to the Dive master Internship. Phi Phi Scuba Diving Centre doesn’t have it’s own pool but makes use of the natural and gleaming sandy waters of Tonsai Bay, confined water the way it should be done. Confined water is where the Phi Phi Scuba Diving Centre instructors teach the techniques of diving in shallow water, for beginners where you can stand. Phi Phi Scuba Diving Centre is able to teach with 2 world renown systems, PADI and SSSI and so it is an ideal school to learn the highest dive industry standards in 29 degrees sea temperature and on one of the world’s paradise islands. 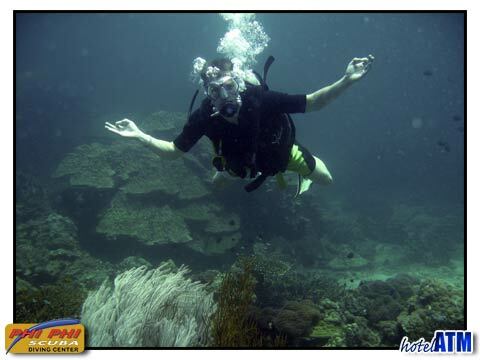 If you are going to Phi Phi Island and need to dive then check out Phi Phi Scuba Diving Centre! Phi Phi Scuba Diving Center, the largest dive school on the island, providing fun, friendly dive tuition and recreation for all levels and ages.